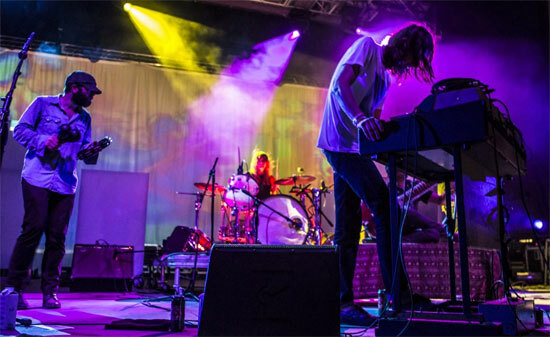 The Black Angels are reliable purveyors of a modern rethink of 60s psychedelia. The Austin group’s updated approach is a kind of tribal psych, heavy on droning, hypnotic and irresistible tunes. The group just released Death Song, its fifth (or sixth) album – we’ll explain that in a moment – and is heading out on the road in support of that record. I spoke with the Black Angels’ Christian Bland in mid-March. It’s been almost exactly four years between the release of Indigo Meadow and Death Song. What has the band been up to in the intervening time period? We’ve been playing one-off shows every now and then; mostly in the U.S. and a little bit in Europe. But mainly over the past four years we’ve just been writing a lot. We started writing this new record in 2014; it’s been marinating for a while. We had about 40 or so songs, and over the four-year period we whittled it down to the songs that we thought were the best, and put them on the record. It’s been a fairly regular practice that not long after you release an album you follow it up with an EP or a non-album single. Not to get too ahead of ourselves – since Death Song only came out April 21 – but since you have so much material, do you think you’ll release an EP or non-album single soon? I think we’ll probably skip the EP and just jump right to another LP, because we have enough songs already. We already have about 10 songs ready to go. Clear Lake Forest came out in mid-2014; it’s classified as an EP, but if you compare it to some of the records that came out in the 1960s, it’s as long as an album. Was there a reason for marketing it as an EP instead of the band’s next album? I like to view it as a full length because it is about 30 minutes long. But for some reason – from a marketing perspective – they call it an EP. But between you and me, it’s an LP. In what ways do you think that Death Song differs from previous Black Angels albums? I think the songs had a little bit longer time to marinate and we crafted them more, more so maybe than Indigo Meadow. There was a lot of time put into this record and I think – I hope, but I don’t know – this record kind of hearkens back to the old sound like Passover. But then there’s other songs like “Half Believing” that are kind of a new sound for us. So we’re trying to push our sound further, too. With its very explicit reference to the Velvet Underground, the album title Death Song is a pretty obvious one. What led to using it now, and why didn’t you do that before? We had a different album title in mind. We have a publishing company called Black Angels Death Song Publishing. And the original title was going to be Death Song Publishing Company. And then we thought, “Oh, let’s just shorten it to Death Song and then when people say “the Black Angels’ Death Song,” they’re saying the name of the song that we actually got our name from. The cover graphics of Death Song are very much a piece with that of the first three albums, which makes Indigo Meadow’s cover art stand out as very different. Can or should someone read any kind of significance into that? If you line all of them up, from Passover to Directions to See a Ghost to Phosphene Dream, then my thinking is that Indigo Meadow sits in the middle of those and the faces are looking to the past and to the future. And since the next one – to my mind – is Clear Lake Forest, it sort of mirrors Phosphene Dream’s design, and then the cover art for Death Song kind of mirrors the circular design of Directions To See A Ghost, so the next one will kind of have a design similar to Passover. My thinking was that you line all of them up, then it becomes one piece. Indigo Meadow is the middle piece where the faces are looking forwards and backwards. To what degree did you road-test any of the Death Song material in front of audiences before recording it? We were playing about four of the songs on the road the last few years. We played “I Dreamt” for a really long time. “Hunt Me Down,” played that out for a while. “Currency” we did a little bit. But the others … Alex came into the studio with some ideas like “Estimate,” so those were fleshed out more so in the studio. And then Dave Garcia – our newest member who joined us in 2013 – wrote the last song on the record. “Life Song” was the first song that he brought to the table. Dave is of the same mind as all of us, so it’s been great having him. When you’re developing an arrangement in the studio, how much thought is given to being able to re-create the song in the context of the live show? Like I was saying, we got many of the Death Song songs down before we ever entered the studio.We had them down so we could play them live. That way, when we went into the studio we could record it all together. We laid down a foundation all together; we’d all be playing our instruments and Alex would sing a “scratch” vocal. And then I’d go back and play some more guitar, organ or whatever. We might add Mellotron or something like that on it afterward. But for the most part, the songs are already pretty well laid out before going into studio. Do you get a sense that there is some intangible advantage in playing together in the studio as opposed to everybody recording their parts separately and then flying everything together? We’ve always preferred to be a unit; that’s the best way. We just to do it as a group. Our live shows are important to us, so we want the recording to sound like a live show. People often remark upon this about Black Angels: everyone in the band plays multiple instruments. Over time, have you discovered that a particular line-up – say, you on bass instead of guitar – creates a specific sonic characteristic or personality that’s distinctly different from other configurations? And if you have, do you consciously use that when you’re putting songs together? I think so. Yeah, you can tell that most on the second record, Directions to See a Ghost, as there are two songs that I play drums on, and they have a totally different feel. I played drums and Stephanie [Bailey] played bass. But then when we went in to make Phosphene Dream, Dave Sardy was said, “When you’re recording, you should stick to the instrument you’re the most efficient at.” That kind of went against what we were doing on Directions, and since then, Stephanie has pretty much remained on drums. We all still switch up; I’ll play bass on songs or organ on some, but Stephanie pretty much for the most part just stays behind the kit. But there is definitely a different feel when we switch. On this last album, we got a Mellotron and I’ve been playing that a lot on all the songs, so I tried to put the guitar down for this record and play more Mellotron.